Physical Therapy Prescription Pads Make Referrals Easy for Doctors! 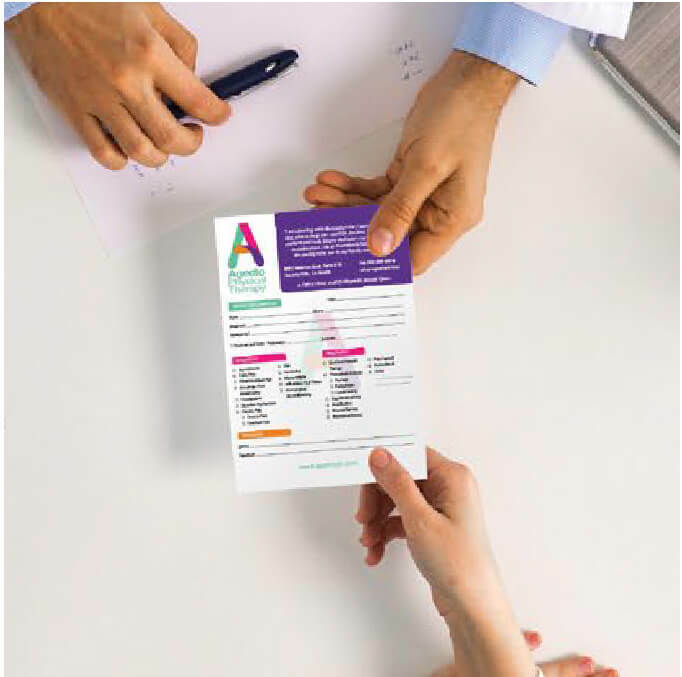 Wow your local doctors and make an impression with patients with these custom prescription pads. Full-color front, 50 sheets to a pad, with cardboard backing. Make it easy for physicians to choose you to refer to. We do all the work of designing, printing and shipping the prescriptions pads to you. Making it as easy as possible to have highly professional prescription pads representing your practice. With over 20 years of PT experience, we have the expertise to quickly write customized content to market your practice’s primary specialties and conditions you treat. Our professional team of graphic designers match your practice’s colors & brand ensuring your practice keeps a professional image. Don’t trust your practice to a template! Don’t have a logo? We can help with that too! You’ll have a single point of contact with our team for any questions. Plus, they’ll make sure your proof approvals and any changes are done properly and on time. Next, upload your logo and provide us with other details about your unique practice. We’ll be in touch if we need additional info, or when your proofs are ready for review! Have you been frustrated by print marketing not generating results? Do you make it as easy as possible for doctors to refer to your practice? With over 20 years of experience in PT and practice ownership, no other printer understands your practice’s needs better. We have a proven history of creating marketing materials that actually get you results. Other printers require finished designs, but you’re busy! All we need is your logo, we’ll do the rest.